John and Caro, the married-but-estranged hero and heroine of The Marriage Act. I returned home from a short trip to discover a nice surprise in my inbox: the cover art for The Marriage Act. I love the expression on the heroine’s face. Is she nervous, excited, or merely wondering if she can turn the situation to her advantage? If you can’t tell, then you’re in the same boat as the hero. And I have an official release date for The Marriage Act. It should be available on July 27. What a nice way to start off 2015. 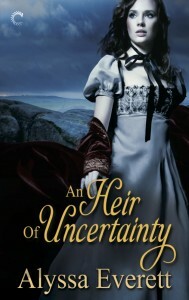 Two different reviewers at Romantic Historical Reviews, Jill and Lady Wesley, both picked An Heir of Uncertainty as one of their favorite books of 2014. You can read their entire favorites list here: Favorite Books of 2014. I also have an official title for my next regency: The Marriage Act. When John, Viscount Welford, proposed at the age of twenty-six to the only daughter of the Bishop of Essex, he thought he knew exactly what he was getting—a lovely and warm-hearted bride, young and innocent but hardly a case of robbing the cradle. He had two excellent reasons to rush the wedding: the diplomatic post awaiting him in Vienna, and his own eagerness to marry the young lady of his dreams. He never imagined that on their wedding night, his new bride would leave him for another man. It should be out sometime in the second half of 2015. I’ll post more when I have a firm release date. First, the audiobook version of An Heir of Uncertainty is now available on Audible.com, and should appear on Amazon.com in the next day or two. Just click the link if you’d like to hear a sample: An Heir of Uncertainty on Audible.com. The audiobook version of An Heir of Uncertainty will be voiced by actress Rebecca Courtney. I have a release date for the audiobook version of An Heir of Uncertainty. It will be available on Audible.com this Thursday, 11/13. Amazon will pick up the release approximately 48 hours later. I can’t wait to hear the narration! I had a great time appearing at the Rogues, Spies and Scoundrels party on Facebook last night. It’s not too late to drop by and read the posts or leave a comment. You can find the event here: Rogues, Spies & Scoundrels. As part of the event, I’m giving away a $15 Amazon gift card. To be entered in the contest, all you have to do is “Like” my Facebook page before midnight on November 15. The page is here: http://www.facebook.com/TheAlyssaEverett. I’ll use random.org to choose the lucky winner. Good luck! Goodreads has determined the winners of my Ruined by Rumor giveaway. There were 881 entries and ten winners– eight in the United States, one in Canada, and one in the United Kingdom. Prizes went out in the mail on September 2, so if you were one of the lucky winners, watch your mailbox for your copy. I found out today that the narrator has been cast for An Heir of Uncertainty. She’s an actress named Rebecca Courtney, and she’s not only performed a wide variety of voiceover work, but also appeared on the stage and screen. I’ll post a release date as soon as I have one. 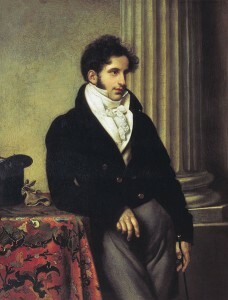 Portrait of Count Sergey Uvarov, by Orest Kiprensky (1815). This portrait was painted in the year my next story opens. I just found out today that Carina Press is interested in publishing my next regency, a “reigniting the marriage” story about a couple who’ve been estranged for five years, ever since the bride ran away on their wedding night. Now comes the hard part–I have to finish the manuscript. I’ll post more when I have information on the release date. Ruined by Rumor was recently released in paperback, and that means I can now offer it on Goodreads as part of their Giveaway program. The giveaway starts at midnight on Wednesday, July 30, and runs until midnight on Sunday, August 31. Just use the button below to enter.